Creating a space requires a lot of planning and coordinating, especially when it comes to color schemes and custom ceramic tiles. Our team can help you by designing custom ceramic tile murals or customizing our existing ceramic tile patterns to meet your specific requirements. Our Crater Field tile was inspired by things found in the universe like the moon’s surface, playful bubbles, and raindrops on the sand. This particular 6” tile pattern can evoke emotions, especially when it is paired with our Crater One and Crater Two ceramic tile patterns. 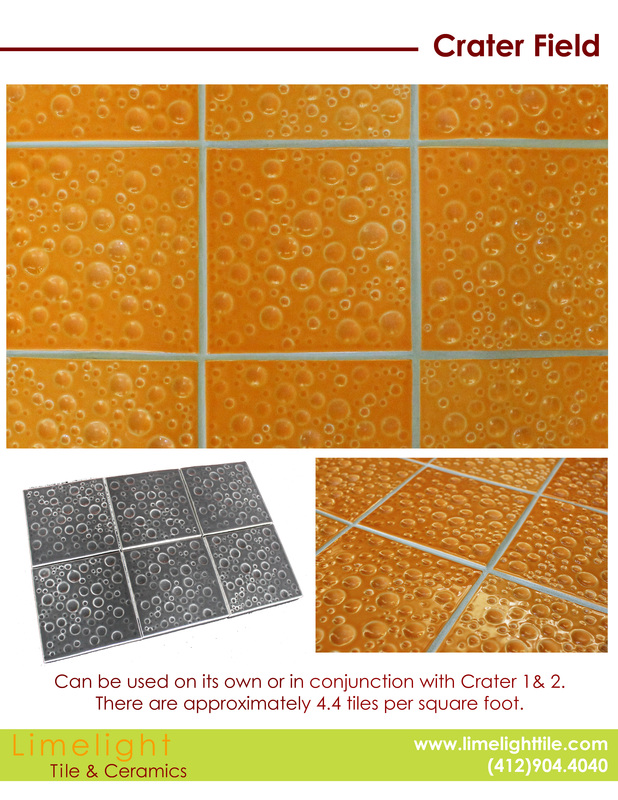 The Crater Field is ideal for backsplashes and tile murals because it can draw in people’s focus. Bring a space to life by choosing a ceramic tile design with the right texture, glaze, and color. If you are interested in this particular tile pattern or want to inquire about the color availability, you can reach out to our team by calling (412) 904-4040 to discuss the specifics.